Mr. Minkov has a master degree in electrical engineering from Moscow Power Engineering Institute, Moscow, Russia. He took several post-graduate studies in utilities automation and process control, project and management consulting in universities and companies in Bulgaria and Russia, Greece and Cyprus, UK, Ireland and Japan. Mr. Minkov has worked for ten years as a project engineer, scientific researcher and assistant professor at the Process Industries Automation Department, Faculty of Automatics, Technical University of Sofia. He has participated in several R&D and engineering projects for companies like Systematics (Honeywell Bulgaria), Sofia District Heating Company, Chimko Fertilizing Co., MetalChem, BalkanCar, etc. Later Mr Minkov was appointed as a head of Concession Department at the Bulgarian Council of Ministers. He moved to the private sector, where he continued his professional career with project and management consulting services, working with companies like Amylum (now ADM) Bulgaria, Heidelberg (today Titan Zlatna Panega) Cement, Union Miniere (now Aurubis Bulgaria), BoozAllen, EON Bulgaria, etc. In 2002 Mr.Minkov joined the management of Ellatzite-Med AD. He is a member, BoM of the copper ore processing operator. 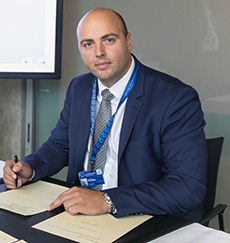 Since its establishment in 2004, Mr. Minkov manages and represents Energeo EOOD – a licensed power trader, member of Geotechmin Group (www.geotechmin.com). Mr. Nikolay Minkov is one of the promoters for creation and development of Industrial Cluster Srednogorie. After its establishment in 2005-6 and once again from 2011 - …, he is an executive director of the cluster.